Roger Federer is relishing the moment next February that he will break Jimmy Connors' 25-year-old record to become the longest-reigning world number one. The Swiss, who beat James Blake to win the Masters Cup on Sunday, will pass Connors' record of 160 consecutive weeks at the top on 26 February. "I think that is definitely one of the big records I've broken, maybe the biggest so far in my career," he said. "I'm waiting for that date to come and then I'll celebrate it, not right now." The 25-year-old's lead in the rankings is such that he is guaranteed to remain number one, even if he does not play again before March. 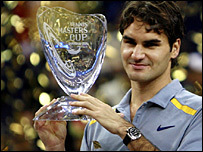 Federer thrashed American Blake 6-0 6-3 6-4 in Shanghai on Sunday to win his 12th title of the year. "I am out of words really to describe this performance," said Federer. "It was the perfect end to an incredible season. "There's not much more I could have done (this year). I gave myself the best possible chance basically at every event. "To come out like this, on top, I surprised even myself, no doubt." Federer won the Australian Open, Wimbledon and the US Open this year, but fell to Rafael Nadal in pursuit of a first French Open crown. "I wish I could have played a bit better," he said. "But I enjoyed it. After all, it was my first French Open final."